Many people are constantly surrounded by fragrances, either natural or synthetic. Fragances are not only an ingredient of perfumes and other cosmetic products, they are also present in detergents and cleaning agents, air sprays, fragrant candles, and in scented oils for burners. There is even perfume for waste bins and hoovers for sale. Some department stores and offices are scented through the air conditioning system. This omnipresence of fragrances can be problematic, especially in sensitised individuals. Relatively little is known at present about the effect of fragrances on health and the environment. What is known is that some fragrances - much like nickel in jewellery - can trigger contact allergies or other intolerances. Individuals who are involuntarily exposed to fragrances may also, just as with noise, develop stress reactions. Anyone afflicted with environment-related health disorders (e.g. 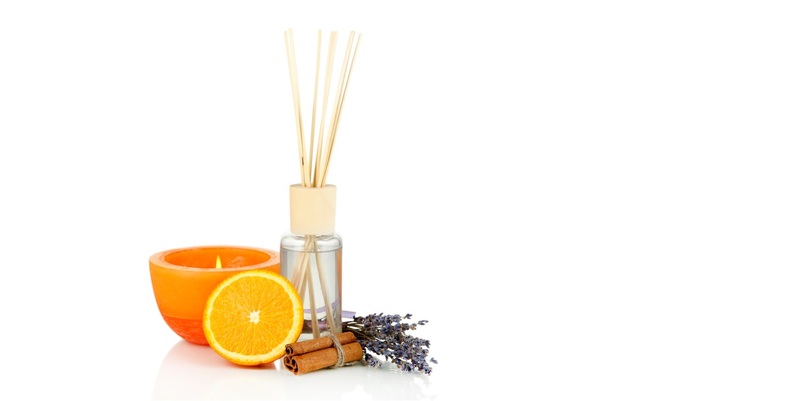 multiple chemical sensitivity (MCS)) may suffer considerably from fragrances. Some of these substances, especially some musk compounds, are persistent and accumulate over time in the environment as well as in animals and man. Fragrances can be absorbed by the organism through respiration and be spread throughout the body by the bloodstream. It is assumed that some of them can also be absorbed by the skin. As contact allergens they may lead to infection (eczema) upon contact with the skin. A study in German done by the German Federal Environment Agency ( Umweltbundesamt) investigated whether breathing in fragrances might also trigger allergic symptoms. It found that contact allergens that are inhaled do not pose a risk of allergy sufferers developing symptoms after inhalation. Yet there are some rare exceptions, especially at very high concentrations. Another study commissioned by the Federal Environment Agency revealed that there are at least half a million people in Germany who have allergic reactions to fragrances. The European Union Scientific Committee on Cosmetic Products and Non-Food Products (SCCNFP) has classified 26 fragrances as particularly prone to trigger allergic reaction. According to the 7th amendment to the EU Cosmetics Directive 76/768/EEC, these substances, which include citral, farnesol, and linalool, must be listed on cosmetic products if their concentrations exceed a certain limit. Manufacturers of cosmetic products often use lower volumes to avoid obligation to declare, or they substitute these substances with others that need not be reported, although they may also trigger allergies. Since 2005 detergents have been regulated by the EU Regulation on Detergents 648/2004 EC, according to which the products with added fragrance ingredients must be labelled as such. For the 26 substances classified as prone to cause allergies, they must be identified by name when used in concentrations of 0.01 percent and above. The ingredients of many other products, for example to scent indoor air, are not subject to any identification by the manufacturer at all if they are not regulated by the Hazardous Goods Ordinance. Imported goods containing fragrances from states outside the EU are subject to the production laws governing the countries of origin, where standards of health and ecology are often lower. Subsequent testing of these products is difficult. Current regulations only provide for sketchy assessment of the risks of fragrances. The new EU chemicals law REACH is not expected to bring about any fundamental changes since, save for a few exceptions, it concerns substances used in amounts of over one tonne per year per manufacturer. Most fragrances, however, are on the market in lower volumes. The Federal Environment Agency recommends exercising caution with scented oil lamps, incense sticks, and the like. The same goes for so-called wellness and aromatherapy products meant to be inhaled. Stale indoor air should not be covered up with fragrances. It is more advisable to remove the sources of unpleasant odours and to air and clean the home regularly.